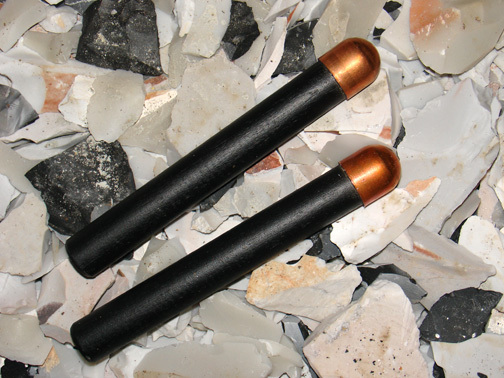 An amazing tool, the Copper Bopper is a modern flintknapping innovation that makes flinknapping much easier. The copper bopper is a lead-filled copper cap mounted on a wood handle, coated with a friction reducing material. This tool is 7 inches long and 3/4 inch wide and weighs a scant 3 ounces. That means you can swing this tool fer a very long time with little fatigue. The copper metal surface seats well on stone and the tool is a dream to use.